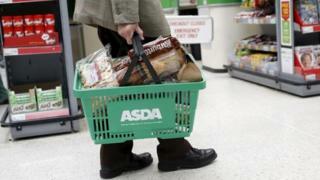 Supermarket chain Asda has reported a slowdown in sales growth amid another "challenging year" for retailers. In the final three months of 2018, like-for-like sales grew 1%, compared with a 2% rise in the previous quarter. Asda chief executive Roger Burnley said that Brexit uncertainties were "playing on our customers' minds". Asda and rival Sainsbury's are waiting for the preliminary results of a UK competition probe into their proposed merger. The UK's competition regulator is looking into whether the proposed merger would leave shoppers facing higher prices or less choice. Despite the slowdown, this was still the seventh consecutive quarter of sales growth for Asda, which has been outpacing its potential partner. In January, Sainsbury's reported a 1.1% fall in like-for-like sales for the comparable period. Mr Burnley said: "The year ahead looks no less turbulent than the last. "Whilst I am pleased with our performance in 2018, we must remain focused on ensuring the long-term sustainable success of Asda for our customers." He said 2018 had been another "challenging" period in retail, but that there had been higher demand for the grocer's own-brand products in the fourth quarter. The owner of Asda, US retail giant Walmart, also reported fourth quarter results on Tuesday. It posted strong like-for-like sales growth of 4.2% after a boost in online sales and higher consumer spending in the US. Thomas Brereton, a retail analyst at GlobalData, described Asda's results as "lacklustre". Mr Brereton said that "the overall feeling will be that Asda has been somewhat unsuccessful in truly exploiting its rebuilt image over the festive period", after returning to Black Friday sales and cutting prices to stay competitive with discounters. But he added that the latest results would be "unlikely to create waves at either Sainsbury's or Asda" as they only cover 13 weeks of sales. "Exactly how the two businesses will merge remains an unclear but intriguing issue, with both owning significant market share - not only across food but also GM [general merchandise] and clothing."